That poor kid. It is not right that there is so much stress on young people to plan their entire lives in advance. I hope that he finds out what his heart’s desire is. Me too! 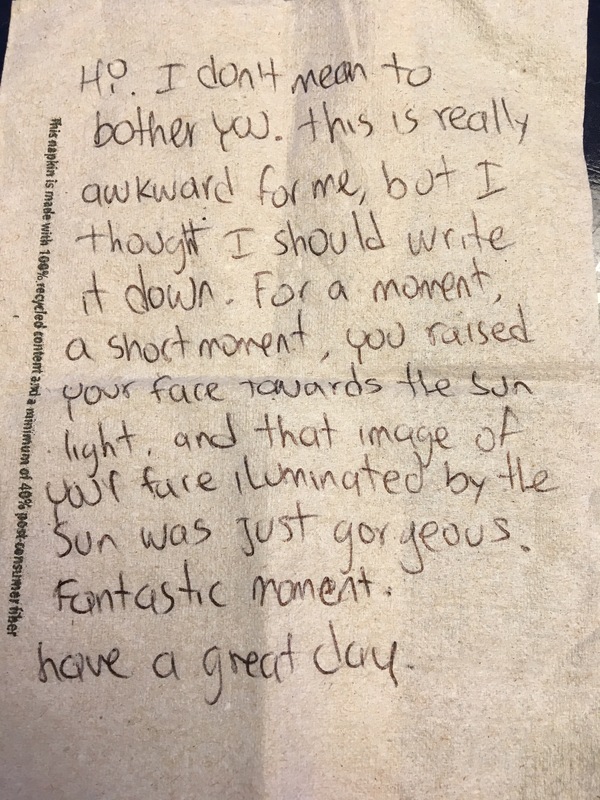 Even if he didn’t find my note useful, I hope he took the kind act to heart. Not a lot makes me cry, but this did. Loving Kindness. When we find ourselves sharing this again and again with strangers or even family members (lol) we know we will find our way home. This entire situation has, and does effect me so deeply, enough to cry as well. I’m glad that you saw the beauty in this and the underlying implications of what this blog post means. I sincerely hope that those who are meant to see it are able to stumble upon it. Thank you so so much for reading all my work and leaving such heartfelt comments <3. This is one of the best posts on authentic kindness that I’ve ever read. People think kindness is for wimps, but it takes great courage to buck a materialistic system and focus on another’s humanity instead. Love that you payed forward what had been gifted to you! Thank you so much <3! This means a lot to me. Also, thank you for sharing it. I was really hoping that someone who needed to read it would find it. And you're right! It takes a lot of courage in today's world. We are not our credit scores. We are not our resume’s. We are products of our actions. We are the concern we show for others. This was beautiful. Wow that is so inspirational! That is incredibly awkward, but I’m sure your efforts and words will make a big difference for him! I wish I’d known those kinds of things when I was younger too, it would have taken a lot of the pressure off and allowed me to just grow and learn, and find out what I wanted to do with my life a bit sooner. Thanks for sharing your experiences! I hope that it does! I hope I get more chances to make a small difference. It certainly would have helped, although the environment that kids are in at that time makes it nearly impossible to not be full of fear and dread for what is to come, and for not knowing if what you did will be enough in the midst of the competition. Better late than never! I think it is a life-long discovery.